As a state, we learned about the importance of storm preparedness in the wake of Irene. We are fortunate not to experience such disaster regularly. We express heartfelt concern for those devastated by the effects of Tropical Depression Florence. Though miles away from our homes in Vermont, such storms can still impact us indirectly. Vermonters may want to donate to charitable storm relief efforts, for example. Fake Charity Calls. 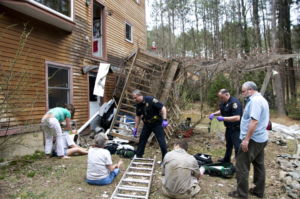 Scammers prey on the vulnerability of people who want to help after a terrible disaster. Such scammers will pretend to be a charity, asking for donations. They may look legitimate, having a website or social media page (Facebook, Go Fund Me, etc. ), or have instructions to text donations to a certain number. Tip: Do your research before giving to ensure the donation is not being sent to a fraudulent charity. Use sites like Charity Navigator and the BBB Giving Alliance to check out the details of a charity. Get more helpful tips from the Federal Trade Commission. Fake Clean-up/Repair Crew. After a storm hits, some illegitimate salespeople may knock on doors and offer to provide cleanup or repair services. Tip: Always check out a business before engaging their services. Ask for references and ask your friends for referrals. Get contracts in writing. Never offer upfront payment! Fake Relief. FEMA scams may make rounds, where callers or door-to-door “inspectors” claim they are from the agency, offering help. They may phish for your personal information or require payment from you to log your information. Tip: Don’t pay anyone claiming to be from a disaster relief agency! Don’t give out your information to unknown callers. If you are seeking governmental assistance, go directly to the source. We hope your friends and loved ones are safe and well. If you or anyone you know has engaged with a scam, please contact the Consumer Assistance Program ago.vermont/gov/cap. This entry was posted in Consumer, Scams and tagged charity, disaster, door-to-door, FEMA, home improvement, Scams, upfront payment by Crystal Baldwin. Bookmark the permalink.